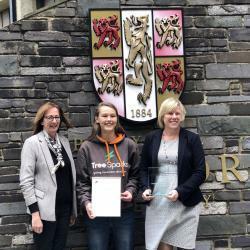 An eco-awareness company set-up by a Forestry student following a period of ill-health has been given a seal of approval from an influential business network in the region. A bout of recurrent seizures led to Jemima taking a break from her studies but, not allowing the condition to hold her back, she used the time to set up Tree Sparks and in a short space of time, has received numerous accolades and awards for her business. Representatives of the West Cheshire and North Wales Business of Commerce had seen Jemima present her business at a Big Ideas Wales event earlier this year and wanted to reward her entrepreneurial skills for setting up such a worthwhile business under fairly trying circumstances. Big Ideas Wales is part of the Business Wales service to encourage youth entrepreneurship in Wales. It is funded by both the Welsh Government and the European Regional Development Fund and is aimed at anyone between the ages of 5 and 25 who wants to develop a business idea. The event’s judges were highly impressed with Jemima’s business and awarded her both the Social Impact Award and Future Entrepreneurship Award, along with a £1000 grant to further develop her business.